Eliminate the E3100 error message. Our friendly team are here to help recover your video data. Even Sony Service Centres have sent camcorders to us with this problem so we must be doing something right! What causes the E3100, and what symptoms may I see on the HD handycam? In our experience this is usually down to the hard disk itself. It will have some bad sectors or CRC errors on the hard drive. Before you finally get to this faulty stage, it is likely the camera may have shown some early signs of this wear and tear on the disk drive. Perhaps the USB may not connect to show the camera on your computer desktop or as a drive letter. Other times video transfer was slow or intermittent. That is is you have ever transferred your videos off the hard drive at any time. You did .. didn't you? Well at least you were going to do a backup at some stage but the cat needed feeding first then you forgot about it. Don't worry - most of our customers fall into the category so you have plenty of company. 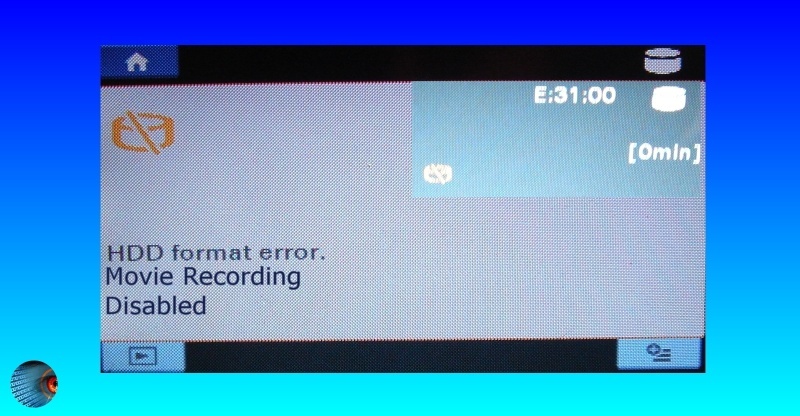 I have connected my camcorder to the desktop computer and it shows nothing but the E 31:00 HDD Format Error and it also shows 0 minute. How can I recover my videos? I have this error on my SONY DCR SR68. "unable to access the HDD" while I'm trying to format it. How can I solve this problem now? How to prevent Handycam's E:31:00 in future. Probably nothing will prevent this. Treating your camera gently may prolong its life. But at the end of the day, it contains a very delicate hard drive, which can accumulate many errors - perhaps before you realise it. The trouble is that unless you are regularly viewing your movies on the camcorder, it is unlikely you realise a problem may be developing before it is too late. As always with digital gear it is better to backups regularly to a different usb hard drive or computer or dvds. ... only AFTER recovery! The HDD FORMAT ERROR may occur if data becomes corrupt on the camcorder’s hard disk drive. To resolve this issue, it will be necessary to format the hard disk drive and reset the camera to factory specifications. Usually you have to press the reset button located on the Camcorder near the LCD screen. If the issue is still not resolved, a new HDD may be required, especially if you have "unable to access the HDD" displayed. E:31:00 HDD format error Sony Handycam Camcorder Recover Transfer Video problems that we recover data from are listed below. E:31:00 HDD format error, Movie Recording Disabled, E-31-00, E3100, E:31:00 error, sony handycam e-31-00 error, camcorder E3100, handycam format error. Recover video from e3100 E:31:00 HDD format error Sony Handycam Camcorders movie clip footage unable to access camera and transfer video clips.